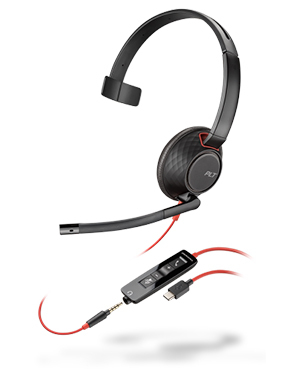 Plantronics Blackwire C5210 Monaural USB-C Headset with 3.5 mm Plug is an innovative device that showcases universal connectivity and all-day comfort. This headset can be connected to several types of mobile devices, including laptops, tablets, and smartphones. This flexibility with its connectivity makes it perfect for all types of workers in the market today. Plantronics Blackwire C5210 Monaural USB-C Headset is able to provide comfort through its padded headband and perfect fit design. The entire device can be adjusted depending on the user’s preference. All of these factors allow users to be comfortable even already when using the device for an entire day. In addition to comfort, the device also features incredible audio quality that results to improved productivity. Plantronics Blackwire C5210 Monaural USB-C Headset offers users with crystal clear conversations, which helps users be able to understand the person on the other end better. Hearing conversations more clearly will help improve work productivity. Call Headsetsonline hotline now at Australia wide 1300 131 133 for more information on this device today. Headquartered in Santa Cruz, California, Plantronics is an international developer and manufacturer of consumer electronics products and solutions that come in the form of home and office headsets, unified communications solutions, Bluetooth devices, enterprise solutions, mobile and gaming headsets, digital enhanced cordless telecommunications, PC audio devices, contact centre solutions, and small business communications products and solutions. Plantronics is currently headed by CEO and President Joe Burton with the support of approximately 5,000 employed experts in various fields, working for the company worldwide. In addition to the company’s employees, it also has distributors, retailers, partners, original equipment manufacturers, and service providers in 80 countries in Europe, North America, and Asia Pacific Region. Plantronics is known to be one of the currently frontrunners in the industry and has been doing so since its establishment in 1961. In fact, the company is responsible for producing some of the best cutting edge technologies and systems in the industry. Headsetsonline Pty Ltd is an Australian enterprise that specialises in offering high quality headsets, headphones, speakerphones, and audio solutions in the market. The company takes care of all of its products by getting directly from Australian distributors and avoid having transactions with grey imports. This ensures that all products and solutions have high quality and are Australian standards certified. All of these products and solutions come with warranties that are applicable all over Australia, wherever they are located all over the country. And to top its powerful product portfolio, the company offers incredible supporting services that empower the products and solutions from the company. Headsetsonline is an online store that operates through its secured and enterprise-encrypted site at Headsetsonline.com.au, structured with high level security that include 256-bit identity authentication and 2048-bit root encryption, which are security for logins used by banks. In order to have better security and protection, it also has GeoTrust True Business ID with Extended Validation and green URL Address bar HTTPS.